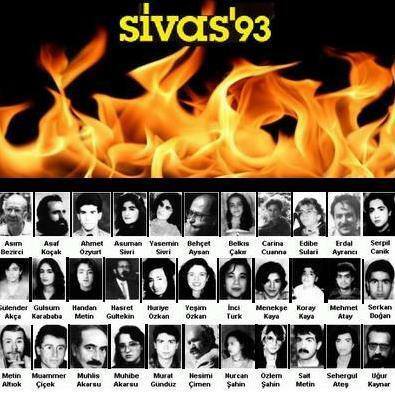 Today is the Twentieth Anniversary of the Sivas Massacre. I was in Turkey at the time and remember the utter horror I felt at the news of the events. With each passing hour, the crowd became increasingly ugly and, as security officials passively looked on, they set fire to the hotel. Caught between a rabid crowd and the flames, a few, including [writer] Aziz Nesin, managed to escape, but more than thirty perished, including a number of children. Today, we mark the anniversary of the Sivas Massacre with sadness and with determination. This entry was posted in Impunity, Minorities, Uncategorized and tagged 301, Anniversary, Armenian Genocide, Aziz Nesin, impunity, Sivas Massacre. Bookmark the permalink.